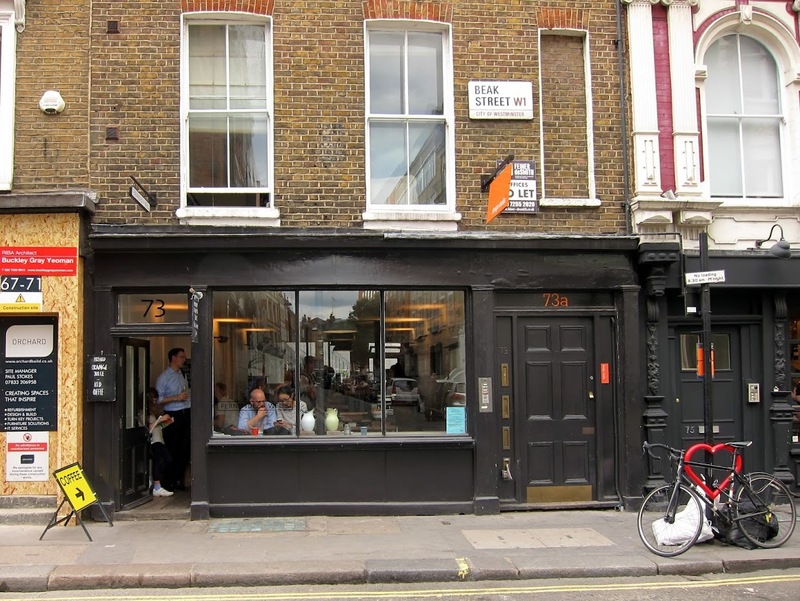 With its fantastic Beak Street location, right in the heart of Soho, Fernandez & Wells was one of the first speciality coffee shops I discovered in London and is the latest to feature in my 'Caffeine Chronicles...Revisited' series. The Beak Street branch is the second location in what is now a mini-empire of cafés. It opened up in spring 2007, shortly after its elder sibling — just around the corner in Lexington Street — which focuses on wine, bread, cheese and cured meats. I first visited Fernandez & Wells in late in 2007 and it has featured briefly on this blog on numerous occasions, including my first list of top London coffee shops back in 2011. But somehow, I never quite got around to giving it a full write-up. I often suggest the Beak Street café as a meeting point in Soho for friends, family and visitors to London, partly because the coffee is good and partly because it's a very cosy, welcoming place. Some speciality coffee shops can be a little intimidating if you don't know the lingo, but Fernandez & Wells keeps things relatively simple. There aren't hand-brewed filter coffees on offer, just espresso-based drinks made using a special Has Bean blend. Newbies may, however, be baffled by the 'stumpy' on the coffee menu, which is, essentially, a small flat white (although bigger than a piccolo). In the absence of a pourover, I usually order a double macchiato or a piccolo (both are £2.60), and the baristas brew a reliably good coffee. On my most recent visit, I enjoyed a very fine piccolo while doing some research for my upcoming trip to Stockholm. If you haven't brought your own reading material, Fernandez & Wells has an always well-stocked magazine rack to help keep you entertained. With my coffee, I had a slice of sourdough banana bread (£2.60). I didn't get it toasted but the bread was very tasty anyway. The brownies are usually good too, although the brandy and prune variety available last week weren't really my thing. If you are in need of more sustenance, there are usually a few sandwiches on offer, which are huge and tasty. There are a few breakfast dishes too but I'm rarely in Soho in the mornings. The café itself is long and narrow with a high table that runs along the wall opposite the coffee bar. The best seats in the house, though, are those in the window where Beak Street provides some excellent people-watching opportunities. It's not surprising that those stools can be so hard to come by when they make lingering all too desirable. The original Fernandez & Wells cafés now have four sisters in: nearby Denmark Street; Duke Street (Mayfair); Somerset House on the Strand; and Exhibition Road in South Ken. They all have great locations, but I'm still loyal to the Beak Street branch. Fernandez & Wells. 73 Beak Street, London, W1F 9SR (Tube: Piccadilly Circus or Oxford Circus). Website. Twitter. Instagram. I can't believe I've still not been to the original (well, sort of, given that Lexington Street is not so coffee-focused). Particularly as I really like Somerset House and Exhibition Road (not so keen on Denmark Street and not been to the Mayfair one). I really must rectify this! !